When your deck or dock starts to become old, worn out and faded it’s time to look into replacing it. A new dock could be exactly what you need to give your backyard a revitalized look. At Keys Deck & Dock Supply we focus on installing and replacing decks and docks in the Pompano Beach area. If your deck or dock has seen its better days, contact our team today to learn about the different options you have for a new deck or dock. What material is best for my dock? Wood docks are becoming obsolete. They can get mold and mildew if you don’t routinely keep up with them, and also can become hot from the sun or slippery when they get wet. Brock Dock is one of our PVC decking options and has many benefits over traditional wood docks. They provide minimal heat retention so you won’t need to worry about burning your feet when you walk on your dock. Our Brock Dock’s come in two different patterns, our contemporary X pattern or wood grain. Unlike wood docks, PVC docks require little maintenance and are much safer than traditional wood docks. Brock Docks have a patented clip strip connection which keeps screws hidden, making these docks very safe. When thinking about getting a new dock you want a dock that will last and most love that PVC docks require little to no maintenance. You don’t have to worry about repainting or staining your dock, because they won’t fade from the suns UV rays. They’re slip resistant and will not splinter so they’re among the safest docks available. This is important for families with young children. Brock Docks are sure to last and will provide you with the best docking material available. If it’s time to replace your dock we encourage you to contact our team at Keys Deck & Dock Supply. 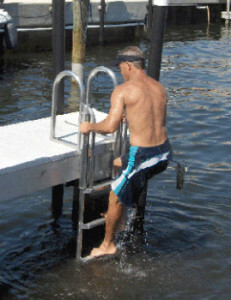 We have a variety of different PVC docking, and our Brock Dock is one of the most popular. With little maintenance you can spend more time having fun and doing the things you love. These docks come in different colors and offer two different styles, so it’ll be easy to choose a beautiful dock you’ll love. If you have any questions contact our team at Keys Deck & Dock Supply today. We are a manufacturer and distributor of quality deck and dock products. We invite you to browse our inventory of fine deck and dock supplies.